British band In Faith released their debut album “There’s a Storm Coming” through Rocktopia / Cargo Records on 24th October. Reading the press release from Rock ‘n’ Growl Promotions my eye immediately focused on the fact that members of In Faith had previously played in bands such as Vaughn and Eden’s Curse and that there were guest appearances by guitarists from Tyketto and Furyon. That was enough to warrant a quick listen and the subsequent decision that the album was definitely worth downloading! 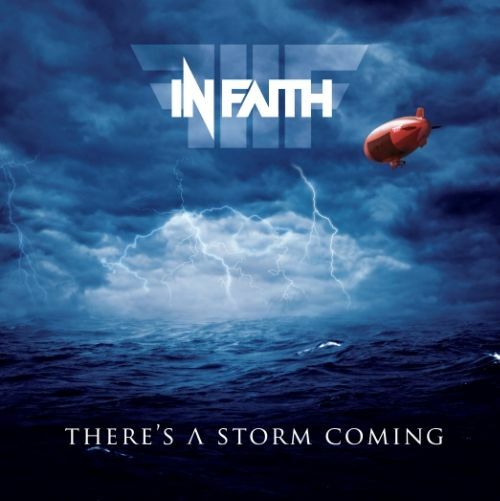 The debut album from In Faith certainly delivers a very listenable brand of melodic hard rock. 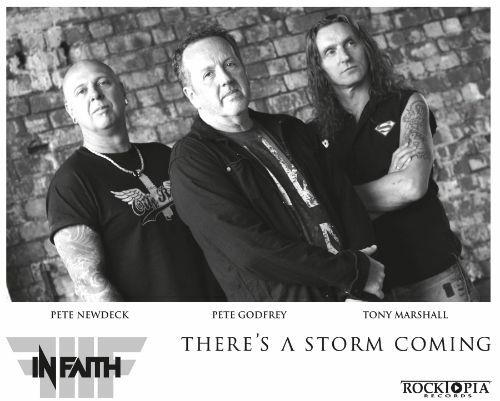 The In Faith line-up consists of Pete Godfrey on vocals, Tony Marshall (ex Contagious, Pride & Vaughn) on guitar and Pete Newdeck (Tainted Nation, Newman & ex Eden’s Curse). There are a few note-worthy guest guitarists in the form of Brooke St James (Tyketto), Chris Green (Furyon) and Pat Heath (ex Furyon). The album was produced and mixed by Newdeck, co-produced by Marshall and mastered by Harry Hess of Harem Scarem. The simple idea behind “NI Rocks Recommends” is to acknowledge and promote some of the great music being submitted to Rock Radio NI. To be honest I’m not really a big fan of “Reviews” expressing positives or negatives which essentially just represent one person’s opinion. With “NI Rocks Recommends”, I'll not be giving marks or ratings or dissecting every aspect of the album; just telling you something about the artist and the album and that I like it! My musical tastes covers most things from heavy melodic rock (anything too melodic bores me!) to the lower echelons of the metal genre (where it’s not ALL growling and screaming!). The albums that I’ll be recommending are merely those that I would buy myself and which you’ll be hearing played on my shows on Rock Radio NI.